PACIFIC BEACH, Calif. (KGTV) - When Michael Kenney sees plastic, he has two immediate thoughts. His first thought is disappointment. “This plastic waste is finally catching up to us,” Kenney said. But once he gets beyond worrying about the global plastic waste problem, he gets inspired. “You can do anything,” he explained, showing off a bodysurfing handplane he made out of number 2 plastics that he collected. He sells the products on Instagram and Etsy though his small business, Unnatural Surf. It all started when he ran over a bucket while surfing in Spain. “It actually knocked me off my board because it hit my fin so hard,” he remembered. Kenney took the white bucket home with him, cleaned it, cut it up and ended up melting it down to create his first piece of “upcycled” plastic. 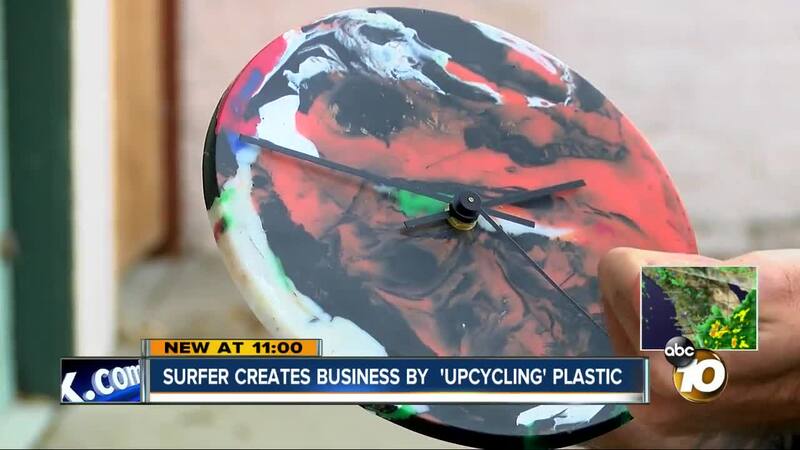 “My initial idea was to make a surfboard out of recyclable materials,” he said. He decided that was too big an undertaking to start out with. Kenney settled on making a handplane, which is used by bodysurfers to help them navigate the waves. Since then, he’s made a variety of products, including clocks, cutting boards, surfboard fins and combs. Kenney is not alone. Websites like Precious Plastics publish directions for people to build and create their own plastic recycling tools. He does all his work in a small space in his garage. The process involves cutting the plastic into small pieces, melting it down and molding into new shapes. He gets his plastics from various sources. Some are from bottles or jugs he’s used himself. Others come from friends, neighbors or pieces he finds along the beach. Right now, he only uses HDPE, labeled as number 2 plastic, because it’s both durable and can float, but he says other plastics can be used as well. Learn more about Kenney’s products by visiting his Unnatural Surf Instagram page or online store .